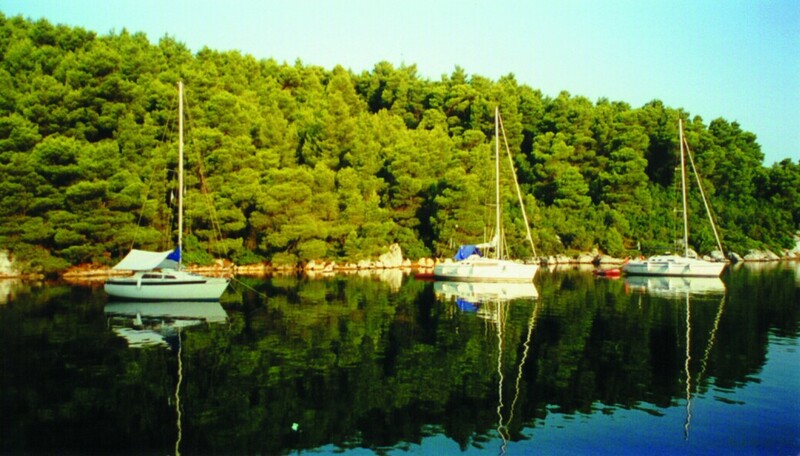 Marine and Sailing Enterprises S.A. are again organizing weekly programmes for marine vacation in the complex of the Northern Sporades. By joining this marvellous excursion you will enjoy the beauty of Greece in a unique vacation by sailing in the fascinating Aegean, swimming in the clear blue sea, discovering lonely islands and secluded beaches, visiting picturesque villages, relishing Greek specialties at the local taverns and night clubbing at the Islands. Our well-trained and experienced skippers as well as our fully equipped yachts guarantee a safe and unforgettable vacation. If you know about sailing you are welcome to give the skipper a hand, if not, you might learn some basics about it. Or you can also just relax and let the skipper take care of everything. Our boats depart every Saturday at 7:00 a.m. from the Marina of Thessaloniki and return there the following Friday evening. Friday, we gather at 18:30 (those who are already in Thessaloniki) at our company’s office where you meet your skipper and get acquainted with the rest of the group. 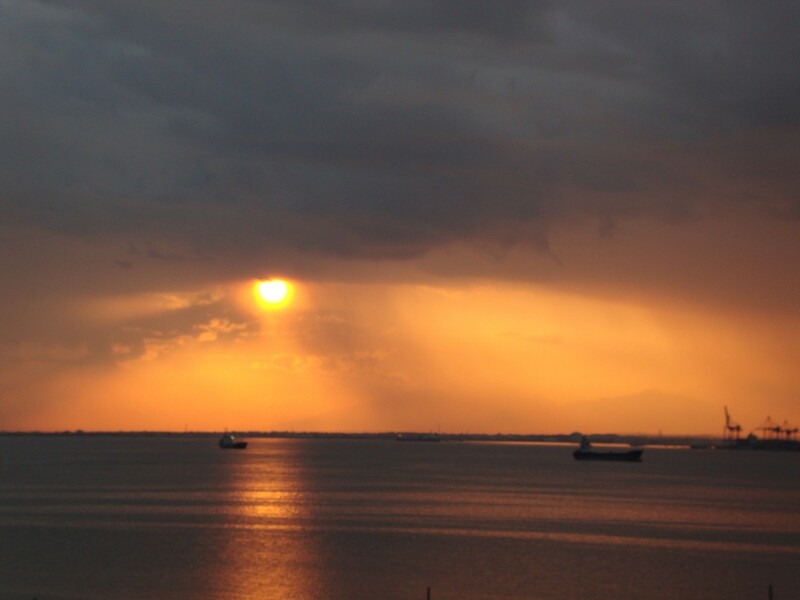 Saturday we meet at 7:00 a.m. at the marina of Thessaloniki and set sails. In the afternoon we stop for swimming, lunch and relaxation at Posidi, a beautiful beach on the first peninsular of Chalkidiki. Saturday evening we depart for some exciting night sailing to the island of Kyra-Panagia (N. Sporades) and arrive at Agios Petros (the South harbour of Kyra-Panagia) at dawn. In this way we experience the night sailing and gain one extra day in the Sporades Complex. If the weather conditions are inappropriate, Saturday evening we sail to the picturesque little harbour of Skioni (Chalkidiki) and depart for Kyra-Panagia on Sunday morning. The uninhabited island Kyra-Panagia belongs to the Sporades complex, with pristine clean sea, it is mountainous and full of beautiful cliffs, ideal for climbing and exploring. 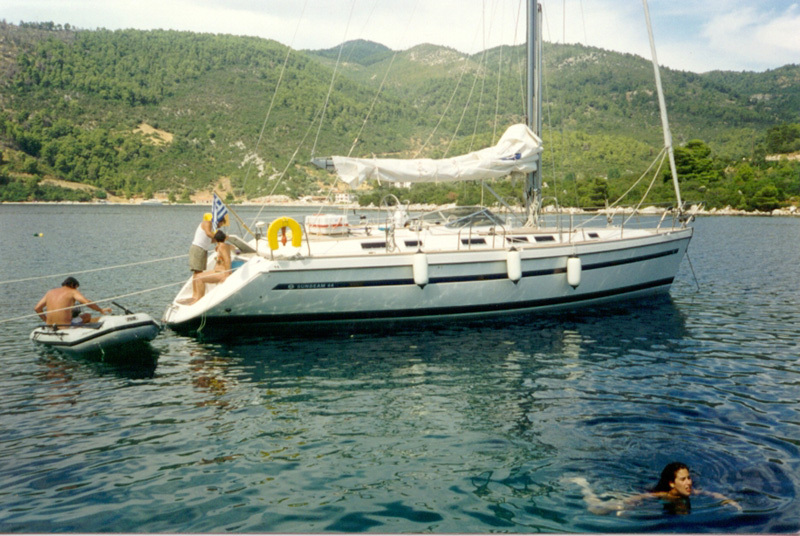 Sunday noon we sail to Steni Valla on Alonissos island. There we could get provisions from the market situated on the harbour, taste fresh fish and traditional Greek cuisine at the local taverns and also visit the old capital of Alonissos with its beautiful architecture and the panoramic view. Monday morning we head for Skopelos. On our way there we anchor in one of the beautiful bays of Peristera for swimming and arrive in the afternoon at the picturesque harbour of Skopelos. 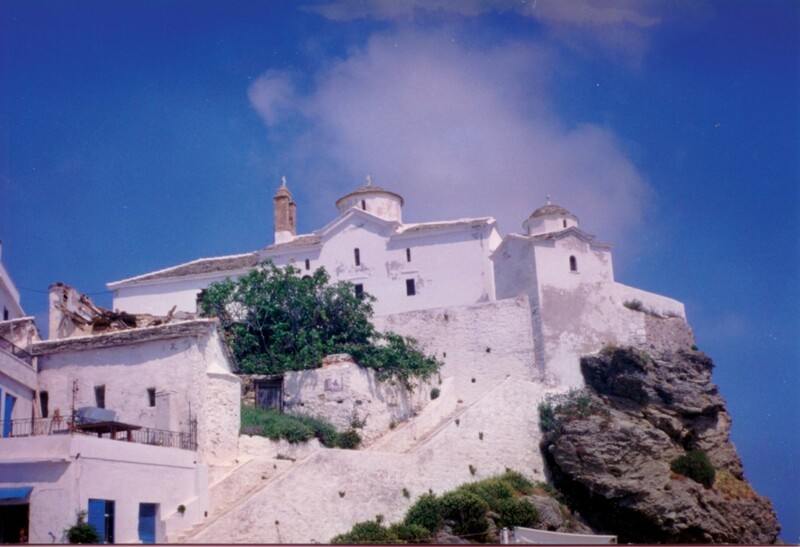 There we could taste the local specialties (Skopelos’ cheese pie), have fun at the local bars and clubs and visit the numerous little churches. Even a simple stroll through the narrow streets of Skopelos is a memorable experience. 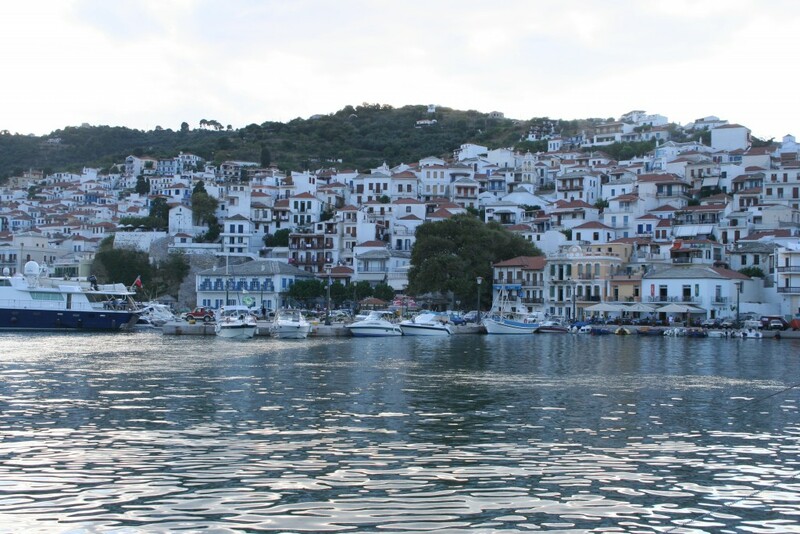 Wednesday early in the morning we set sail for Kamari (Pilio), a picturesque, small, well-protected harbour. On our way there, depending on the weather, we stop for swimming either at the renowned pebble-beach “Lalaria” or at Agios Giannis, at the foothills of Pilio Mountain. We spend the night in Kamari. Thursday morning we depart for Stomio (Tsagietzi) and arrive in the afternoon; there we can swim at the sandy beach and enjoy fresh seafood at the local tavern by the sea. In the evening we set sail for Epanomi and anchor –depending on the weather- either at the wreck or the harbour of Epanomi. Friday morning we depart for Thessaloniki and arrive at the marina in the afternoon. At the Marina, with our captain’s help and instructions we clean and tidy-up the boat. Suitcases are not allowed on board, so you should please use a small sport bag (without wheels). 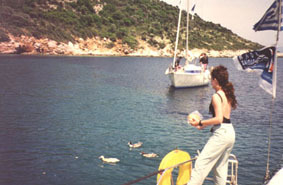 Every participant should bring: one pair of light-coloured rubber-soled shoes to use onboard (not black sole because it leaves marks all over the boat), warm clothes for night sailing and in case of a bad weather, a jacket (oilskin), sun protection cream (high SPF), swim suits, shorts, T-shirts, a towel and optionally a sleeping-bag. We provide sheets, pillows and pillowcases. But please take as little as possible, because there is limited storage space on board. The price of this 7-day excursion is 500,00 Euro per person and includes: accommodation on board, fuel and water for the boat, skipper and moorings. In order to register, a 50% payment in advance is required (250 €) while the rest 50% (250 €) should be paid –the latest- one week prior to departure. 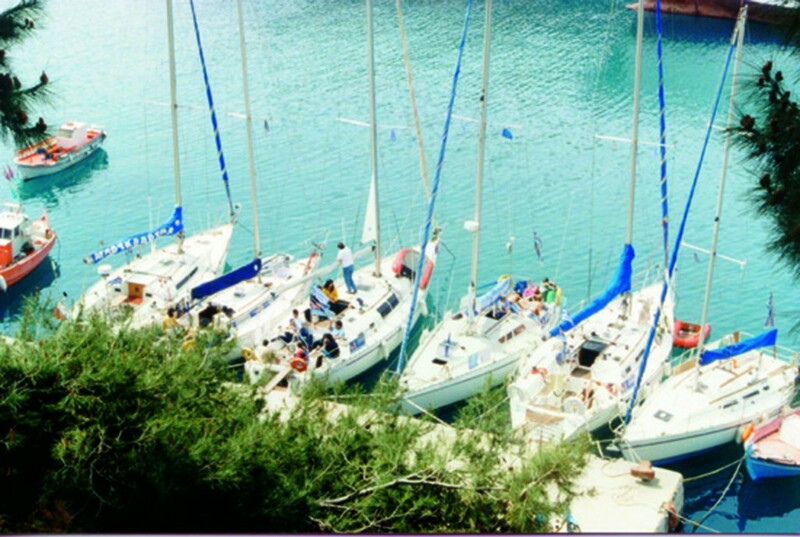 The 7-day sailing excursion to Sporades takes place from April till October, as long as there are minimum 4 participants. Small changes in the above route may take place due to the weather conditions. For further information, available dates and reservations please e-mail us at: mse@sail.gr or call: +302310-429.770, +302310-429777 and +306944-439.514.